Plot:Melinda Gordon (Jennifer Love Hewitt) has the ability to communicate with the earthbound spirits of people who died, providing deeply moving and important closure for them and their loved ones. The ghost of a man who was buried in the wrong grave starts to haunt a cemetery as someone else’s wife is coming to mourn him every night. Melinda must reconcile the man with his hostile wife and daughter in order for him to be able to cross-over. This episode is a good example why i lost interest in the series early on, it becomes all too repetitive and obvious. JLH sees ghost, there's twist in tale for those still living, she sorts out mess, the dead person sees the light, and they all live happily ever after. This is a halloween special and fitting for the marathon, but little more can be said for an average episode, despite the appearance of familiar actor David Palmer. I like Emily Rose too. I wasn't really scared by the movie, but it did freak me out a bit in certain scenes. I thought Emily Rose was a good watch as well. I wonder if anyone has seen both Emily Rose and the similarly themed German Requiem, which came out around the same time? Rich, have you seen The Exorcist? There's a scene in the extended version I suspect might make your toes curl! Plot:Jennifer Love Hewitt, Freddie Prinze, Jr., Brandy, and Mekhi Phifer star in the screamer sequel to the blood-chilling box office hit I Know What You Did Last Summer. he's the man in the slicker with a hook in his hand ready to exact bloody justice. Well, he's back. It's hard to forget a man who refuses to die. Weak sequel, ridiculously obvious but at times unintentionally belly chuckling hilarious. Hewitt is unconvincing, and popstar Brandy patheitic in this wet and drippy film that is wrongly tagged a horror movie. The 'killer' dressed as a fisherman is wholly comical, and the 'twist' in the tail signposted after about 20 minutes. On the plus side some parts were so ridiculous they were funny, and I didn't realise Jack Black also appeared in this flick as a weed smoking rasta. Bad - even for a sequel. Too bad that DVDP haven't choose the second sequel "I'll Always Know What You Did Last Summer"
Plot:What does a stray cat have in common with a radical technique to quit smoking, the window ledge of a skyscraper and an evil goblin? Three of Stephen King's most imaginative tales are brought to life in this chilling collection of short stories. Witty and clever opening with the appearance of Cujo chasing the cat, and Christine nearly running them both over. The cat plays a linking role in all 3 of the features. Sadly all 3 titles in this offering are extremely dated, and this did detract from my overall enjoyment. 1/ The most bizarre service given by Quitters Inc to give up smoking, this is neither horror nor particularly pleasant. The only positive is the acting of James Woods, as the smoker trying to prevent harm coming to his family through his falling off the wagon. This was the best of the 3. 2/ Robert Hays gambles for his life as the lover of a gangsters wife, made to walk around on the ledge of a high rise building. This supposed suspense takes forever, and leads to a most obvious twist in the tail, and again is fairly mundane and not in any aspect horror. 3/ Drew Barrymore is a young child under attack from a pathetic goblin, I guess this must be why they called the whole trilogy a horror? Childrens fantasy more like, very cheesy watching the cat battle this wall dwelling gremlin. Worst of the 3. Plot:May is a terrifying tale about a young woman's desire for friendship, which ultimately turns to obsession. As the subject of constant ridicule from her peers and parents as a young girl, May is forced into a life of unwanted seclusion, Publicly outcast, she believes that her only true friend is the homemade doll given to her by her mother. Now that she's an adult, her deeply rooted scars manifest in vengeful behaviour. May finds herself envying specific body parts of the people she pursues for affection. After numerous failed attempts at companionship, she comes to the conclusion: If you can't find a friend, make one. Not horror at all, despite quite an exciting blurb on back cover, it actually turned out to be just a weird and fairly boring movie. The freakiness is mixed up with some interesting lesbian scenes, and the acting of Angela Bettis and Anna Faris was above expectations. The script was a let-down, and the gore and special effects minimal. A distinct lack of tension has your finger hovering over the fast forward button, and the doll wasn't creepy at all. More of an arty film about loneliness, not sure who it would appeal to? Plot:Seven desperate individuals are trapped in an isolated farmhouse, as a horrifying unnatural phenomena known as the 'Living Dead' begins. An army of the recently deceased have been brought back to life by a mysterious cosmic incident and are determined to fulfil the most primal of instincts - to feed! Petrified by the monsters who ceaselessly attack, and equally suspicious of their fellow captives, it's every person for themselves as they battle to make it through the terrifying Night Of The Living Dead. For the first time ever, own the original and best loved zombie movie of all time as Director and Horror legend, George A Romero intended it to be seen. The feature has been painfully restored and remastered and the sound upgraded to offer a fright-feast of truly nerve-jangling proportions. This Special Edition also includes a host of Bonus Features never before released in the UK! The purists will hate me, but watching this film 40 years after it was made, it has lost a lot of it's no doubt ingenuity, originality and ground-breaking achievements of its time. You have to tip your hat to its influence over so many future films, there is so much you recognise from later zombie flicks in this 60's film. The direction creates a claustrophobic effect, and the ending was against the grain in comparison to the majority of films from that era. On the negatives, the acting is hammed up to the extreme, the production amateurish, the effects clumsy, and a general feeling of being a bit rough round the edge emenates. I hadn't seen this film for many years, and it was good to go back to for prosperity, but in truth my appetite and expectations of a zombie film have evolved, and thus it was more an educational viewing as opposed to an entertaining one. After a cruel joke goes awry, severly burning him and subjecting him to five years of intensive, unsuccessful skin graft treatments, Cropsy (Lou David) is back at camp...and ready to wreak havoc on those who scarred him! With his hedge clippers in hand, he terrorizes the camp and systematically mutilates each victim. Can a few courageous campres save themself and destroy this demented madman before he kills them all? Caretaker turns killer with shears and scissors following a prank gone wrong, and he slowly one by one murders his way through the camps guests. Plenty of ketchup and fleshy close-ups, but the gore does not make up for some fairly inept direction and a dot to dot obvious and boring storyline. Interesting to see young Holly Hunter, Jason Alexander and Fisher Stevens on show. This would fit nicely into Jimmys current marathon. ... not sure who it would appeal to? Me, for example. I got it only because Rian Johnson (writer/director of Brick) worked on the movie as an editor and Roger Ebert wrote a favorable review. But you are right, it is more weird than straight horror - and that's why I like it. Plot:The prequel story traces the origins of the centuries-old blood feud between the aristocratic vampires known as Death Dealers and their onetime slaves, the Lycans. In the Dark Ages, a young Lycan named Lucian (Michael Sheen) emerges as a powerful leader who rallies the werewolves to rise up against Viktor (Bill Nighy), the cruel vampire king who has enslaved them. Lucian is joined by his secret lover, Sonja (Rhona Mitra), in his battle against the Death Dealer army and his struggle for Lycan freedom. Pointless prequel, a bit gorier and fun than the other 2, and loaded with action. I thought some of the CGI effects were below par, a lot of the fight scenes messy and hard to follow, the love story sloppy and the choice of theatrical cast a mistake. I really liked the original, but this poorly scripted attempt was rather disappointing, and felt like it was dragging out the title to the extreme. Fantasy and action, and a great act by Bill Nighy, just made it to the average stakes. Plot:Plug in the power drill and break out the socket wrenches! 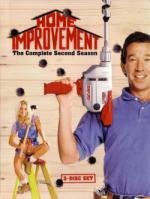 Tim Allen hammers home the laughs as Tim "The Toolman" Taylor in HOME IMPROVEMENT'S hilarious second season. Tim and his level-headed wife, Jill, undertake the challenge of raising three young, mischievous boys. It's a tough project, but with insightful advice from his wise (and only partially seen) next door neighbor, Wilson, they're able to get the job done. Brad and Jennifer plan to dress like Raggedy Anne and Raggedy Andy on Halloween, but she shows up with Danny and is instead dressed like him. After Danny tries to ruin Tim's "Catacombs of Terror", Tim scares him with the help of Al and Wilson. No great surprises, fun and family-friendly halloween special of this unoffensive comedy series. Particularly liked Al's floating head on the tool chest. Plot:In its hilarious third season, millions of fans made Home Improvement the #1 sitcom in America. Tim Allen and the cast laid the foundation for one of the funniest series in television history, and audiences everywhere loved it! 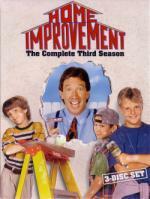 Also a hit with the critics, season three garnered a Golden Globe® nomination for Best TV Series in the Comedy/Musical category, and Tim Allen was nominated for Best Performance by an Actor in a TV Series in the Comedy/Musical category. It's halloween and as usual Tim is up to his old tricks; however, Jill plans a prank of her own. Tim gets cookies from a fan named Rose but soon strange things start happening. She keeps calling him,and Wilson thinks she is obsessed with him. Tim tries to hide but it's no use. Not as funny as previous episode, the main focus is on a halloween prank on Tim at his party. Can't dislike it, but it didn't hold much substance and instantly forgettable.